Mrs. Sari Alander has M. Sc. in Tech. from Aalto University. She has also Postgraduate degree in teacher education from HAMK University of Applied Science, and Diploma in Global sourcing from Aalto University, and Solution focus thinking therapist studies from Helsinki Brief Therapy Institute (lti.fi). She has DASA DevOps, Scrum, ISTQB, IPMA, PRINCE2, MoP certificates, and she works mostly within DevOps, Agile and Lean coaching in organization and team levels. During her previous professional roles She has gain professional experience with in steel industry, telecommunication, finance and teaching. Her various job roles have covered areas of change management, portfolio and project management, product management, process management, DevOps / Lean / Agile changes, international sourcing and procurement, product development and testing, audits and assessments, product documentation and quality management. 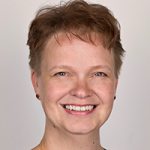 Sari Alander is working in Finland at Knowit, which is a Nordic ICT services company well-known for testing consultancy and software development, and other innovative ICT related services.